The bathroom above is an initial "idea" for some clients in the Mount Baker neighborhood of Seattle. They didn't have a specific design in mind and were looking for ideas for their basement bathroom which is due for plumbing upgrades which will involve partial gutting of the space. By adding the vanity and tall shelf we've increased storage space while adding visual elements that create a sense depth and verticality. The box behind the toilet has a hinged top and serves the dual purpose of holding a laundry hamper and covering an existing pluming clean out. Below is the final design version. 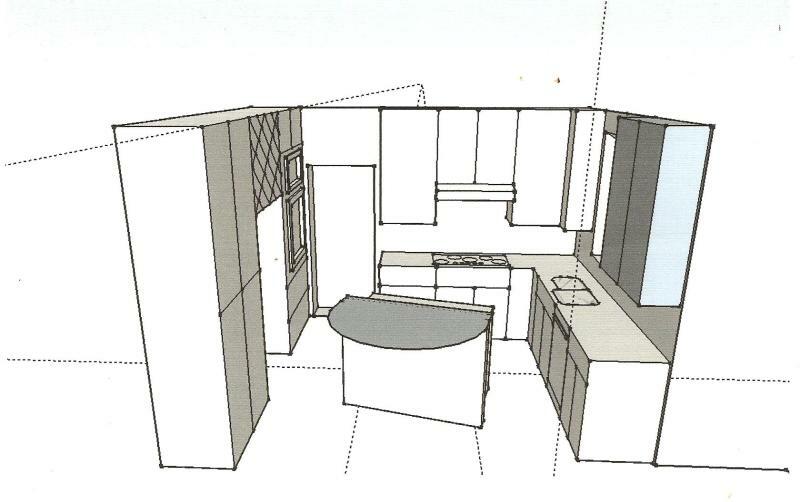 These are some initial proposal drawings for a kitchen in Seattle's Mount Baker neighborhood. It's a tricky space, long and narrow, but by using undercabinet refrigeration and eliminating an existing floor to ceiling panrty this design creates a more open feeling while adding much needed counter space. Removing the wall between the kichen and dining room allows the two spaces to work together as one, creating a more open and inviting area for entertaining, family meals, supervising the children's homework or games and allows us to change from a 30" range to a 36" without sacrificing cabinet or counter space. Here's an updated view of the fridges and freezer arrangement. 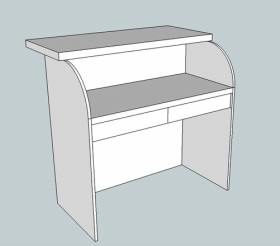 This shows an idea the cabinet maker had during measure up to convert the existing cabinet to the left of the range to a drawer base with two deep drawers for pots and pans. 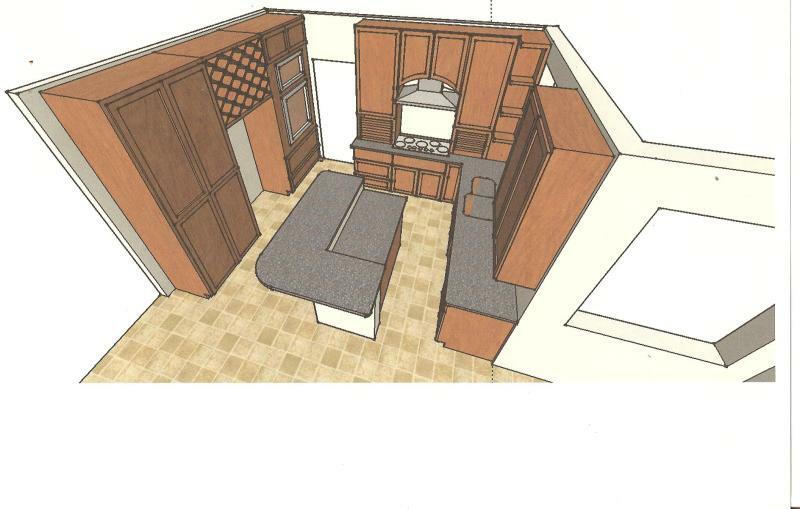 I look forward to working through all the design details of this kitchen as we work toward our goal of starting early next month. Be sure to check back here often for updates! These were some design ideas I put together for a shop on Queen Anne Hill in Seattle. Unfortunately our schedules didn't work out, but I think this shows well how the design can evolve. The top left was the first design, then it was simplified in response to budgetary concerns, and finally became a built-in rather than free standing piece. These are initial concept sketches for another houseboat project. The owners just had their first child and are needing to add some space! 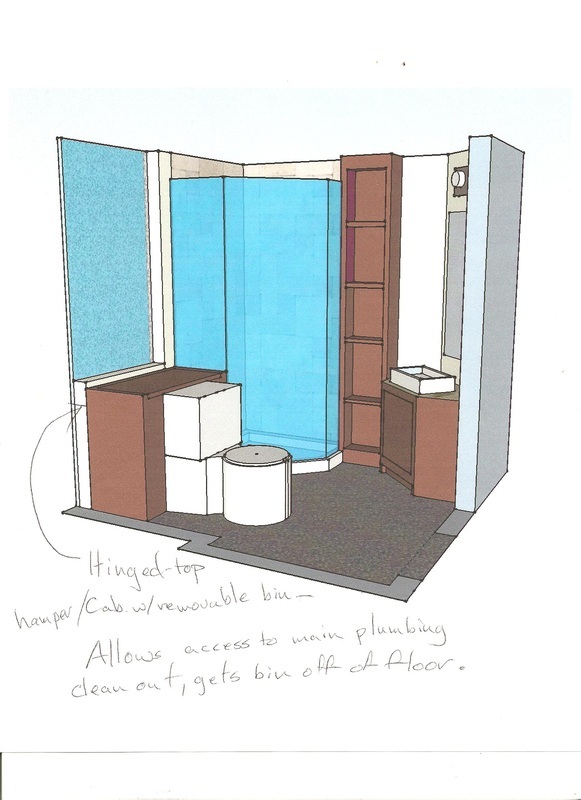 Their plan is to raise the salon (a raised area that's high enough to allow a raised bunk) by four feet to create a room out of what is now a pair of bunks with a twin bed on one side and a study/play area with bookshelves on the other. 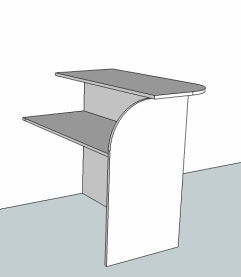 The built in desk covers the area above the stairs to the lower level. Additionally they'd like to add another room adjacent to the salon. This would be the master bedroom, and would be accessed in this version by climbing the cabinet behind the dining booth to reach a floor hatch. 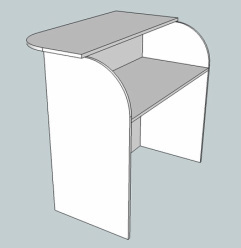 At the bow end, a curved, raised section of roof would provide space for a full sized door. 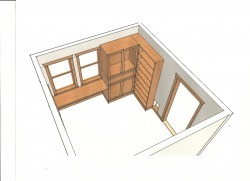 An existing walk-in closet in the salon area might also receive a window to allow for the possibility of using it as a room for little brother or sister some day. This series shows how a design can evolve through the process. Based on initial discussions, my first sketch was valuable primarily to give the homeowners something to react to. The homeowners were able to look at that initial sketch and identify more clearly their design priorities which were to break up the space of the unit to make it look like something other than one large monolithic unit. The next redesign was too symmetrical and didn't address the space above the fold out section, causing the whole thing to read as a unified mass. After getting reactions to those drawings I felt able to go much further. 1the final two designs incorporate removable panels that extend to the floor to brak up the area below the bed which is necessary to allow it to swing out. I designed this Japanese Tanzu inspired staircase cabinet to provide access to a raised sleeping berth on the same houseboat that is now featured on our Projects page. A subsequent redesign eliminated the raised berth and, sadly, the stair cabinet as well. 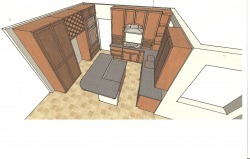 The two drawings below were done for a customer who had already designed the kitchen in her head, but not on paper. We held an onsite meeting at which she described her ideas to me and I took careful measurements of the space. I then went home and created the drawing on the left which I sent to her as an email attachment. 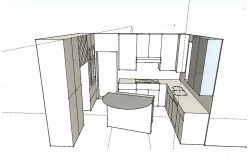 We were then able to discuss specific elements (the size and shape of the island, the cabinets above and to either side of the range) to produce the drawing on the right. At LScarpentry, the homeowner's ideas always come first. The sketch below you may recognize from the Projects page. It is our own Home Office here at LScarpentry and it's the first of these designs I've had the opportunity to build. I'm happy to report the project is going very smoothly and is nearly complete! !